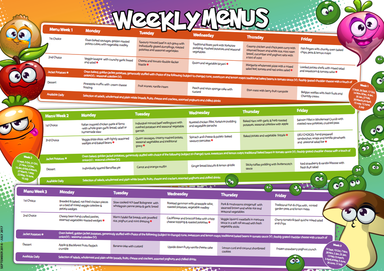 Children who wish to stay for dinner, may either have a school meal or bring a packed lunch. However, they must do one or other during the course of one week; therefore, if they have school dinner they must have dinner every day of that week, and the same for packed lunch. They may change on a daily basis between home dinner and packed lunch, as this does not affect the school kitchens. Dinner money is collected weekly on a Monday morning. Please ensure ALL monies come on a Monday with the child, in the identified school meals envelope. Credits will be given where meals are missed. Parents who wish to try a school meal are welcome to do so ‑ we ask for 2/3 days notice please. Adult meals cost more than a child’s, and should be ordered through the school office. Children who go home for dinner must go home, and should not return to school until 12.55 p.m. Children are not allowed to leave school premises during the lunch break unless they are home dinners, or are being collected by parents for a medical appointment. Application forms for free schools meals are obtainable from, and returnable to, the Civic Centre. The school reserves the right at any time to withdraw the privilege of staying for school dinner if a child’s behaviour is not in keeping with the school rules. At dinner time, children are expected to behave for the dinner nannies; if this is abused, parents will be consulted about their child’s behaviour, and subsequent action taken. Hopefully this should never happen. We regularly qualify for the Healthy School Award, which demonstrates our commitment to the all-round well-being of our pupils. We recognise pupils who are good role models in the content of their packed lunches through our Healthy Packed lunch award. This is given when the content of a packed lunch is nutritionally balanced. Please ensure that children do not bring fizzy drinks in their packed lunch.